We just had a Thanksgiving lunch for Interhigh last week and I'm going to write my notes for how I did my turkey. 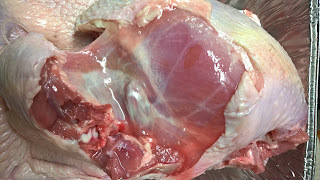 I injected my turkey. 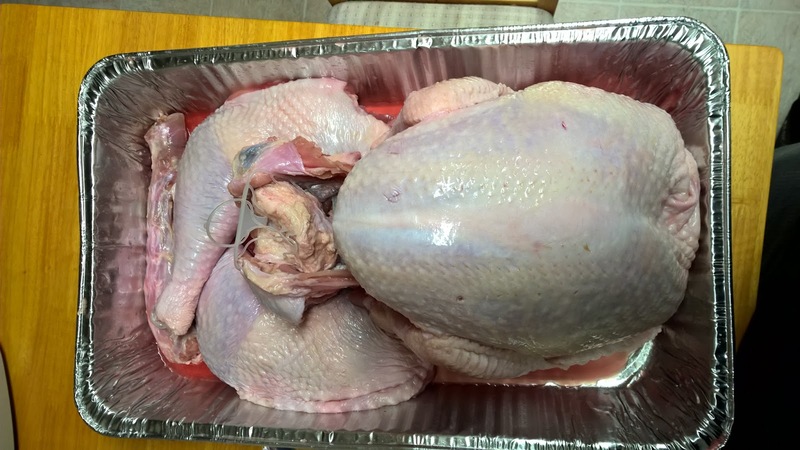 18lb turkey = 12 tsp kosher salt (1/4 cup), 12 tsp sugar (1/4 cup), 1.5 cup hot water. I injected into the breast, thigh, drumstick and then transferred to a small clear trash bag, tied it and put it in the fridge. I like to inject but you can dry brine/dry rub or traditional brine your turkey. 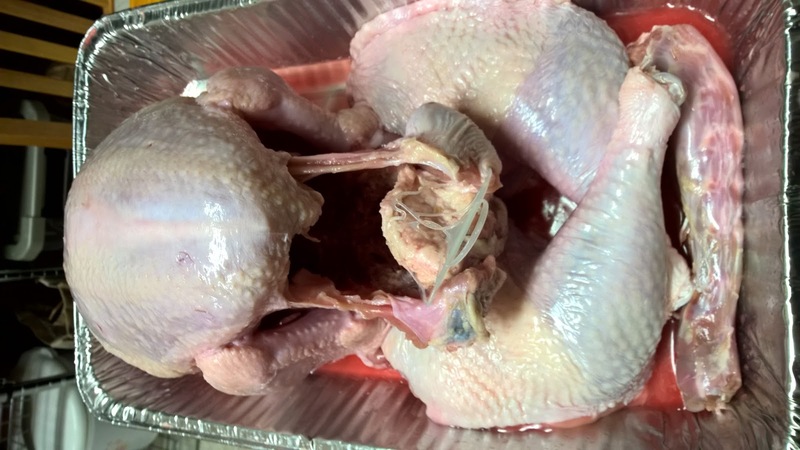 Friday just before midnight: I cut up the turkey. I wrote about this in my last post. I cut off the leg quarters and wings from the main body. It was a little tricky to cut the joints but do your best. I put the oven at 200F. Then I arranged the turkey pieces. The thighs flat on the bottom, the wings tucked against the body. It was the best way to tetris it into the tray. I suppose any arrangement would work. *This is for an 18lb turkey. 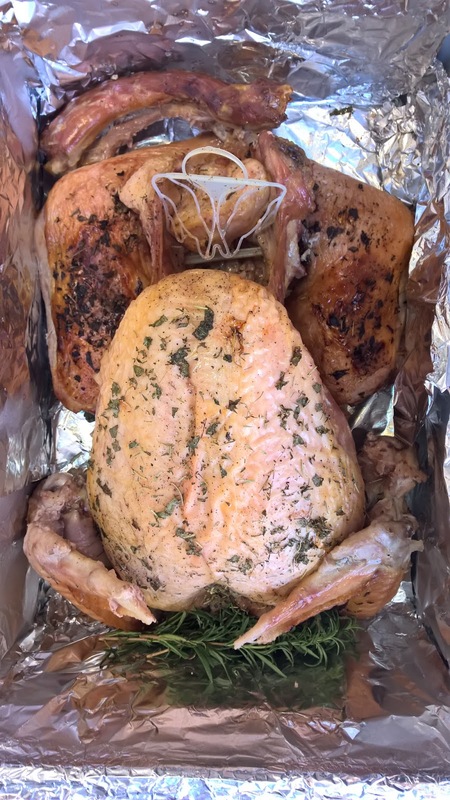 At 200F, most turkeys should cook at the same rate whether 12lbs or 22lbs. That and oven variance can lead to different cooking times. Use the info below as a guideline. I took out the main body and put into my cooler and put the lid on. 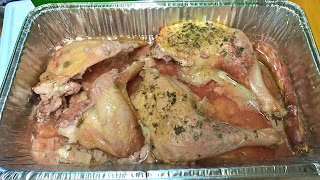 At around 8:45am I took it out of the oven and rearranged the legs with the body to make it fit in the cooler. Start to finish about 8 hours 15 mins. Depending on when your event is, you can back track it and figure out start time. Give yourself an extra 15 minutes to be safe. 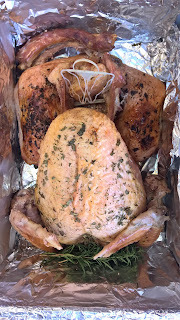 Results: The white meat was one of the juiciest turkeys I ever made. 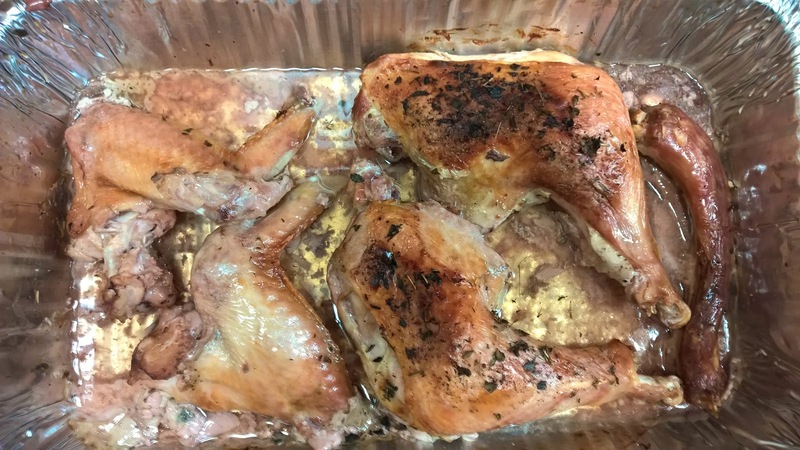 I pulled it out at 156F. It's the border of just being cooked. It will be white with some pink tint (look at Costco rotisserie chicken if you are wondering what white w/pink tint looks like). The juice that pools on the bottom will be clear with a slight pink tint but no blood. 6 years ago I made one that I pulled at 152 and that one was juicier (though a little more pink). The thighs were nice and fully cooked with no blood or redness. you can that area on the sides are fully cooked and roasted here. I tried Tom's method and it worked! No dry or undercooked turkey meat.